Believe it or not, it’s been nearly four and a half years since Apple released the original MacBook Air. At the time, it was revolutionary in terms of its size and weight, but it also was slow, had little storage, had only a single USB port for expansion, and was very expensive—it started at $1799, and if you wanted solid-state storage, the price increased dramatically (by $999!). As Jason Snell wrote at the time, “laptop design has always been about compromise,” and the original Air required some painful compromises. But that Air also gave us a glimpse at the future of Mac laptops: incredibly thin, blissfully light, and surprisingly sturdy, with reliable, fast, flash storage—attributes that have made their way into Apple’s Pro laptop line with the new MacBook Pro with Retina display ( ). It’s safe to say that before long, all of Apple’s laptops will be direct descendants of the Air. The Air itself has also evolved: The second iteration gained some speed, better video capabilities, and more storage. The third generation got faster and cheaper. In 2010, Apple gave the Air its biggest update by adding a second USB port, improving performance, standardizing on flash storage, lowering prices, and—in the biggest move of all—releasing a road-warrior-dream 11-inch model priced at just $999. The company turbocharged the Air last year by upgrading to Intel Core i5 and i7 processors and adding a Thunderbolt port. In a few short years, the Air has gone from an expensive technology demonstration to a successful product firmly established as the heart of Apple’s laptop line. This year’s models improve the appeal of the Air by increasing performance, enhancing expansion capabilities, and lowering prices. 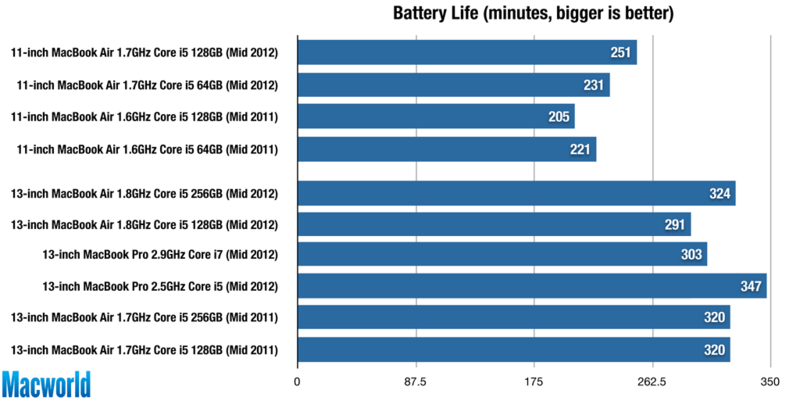 In fact, the new models might just be making the MacBook Pro line a little nervous. Through the Air’s now-six iterations, the laptop’s external design has remained essentially the same. Both the 11-inch and 13-inch Airs are thin wedges of unibody aluminum—just under 0.7 inch thick in the back and just over 0.1 inch thick in the front—though obviously with different footprints: The 13-inch model is 12.8 inches wide and 8.9 inches deep, while the 11-inch Air is just 11.8 inches wide and 7.6 inches deep. The 13-inch Air weighs just under 3 pounds, with the 11-inch version weighing in at just under 2.4 pounds. Flip open the screen, and you reveal a full-size, backlit keyboard—even on the 11-inch model—that uses the same low-profile, flat keys as Apple’s current desktop keyboards. (The differences? The Air’s F-key row uses half-height keys compared to the desktop keyboards, and its bottom row of keys is ever-so-slightly shorter.) There’s also the large, Multi-Touch trackpad that’s ideal for using gestures in OS—it remains the best trackpad I’ve used on any laptop—and an LED-backlit, widescreen, glossy display surrounded by an aluminum bezel. Inside the case is a multi-cell, custom-fit—yes, and still non-user-replaceable—battery system that gives the Air line excellent battery life, despite its slim profile. 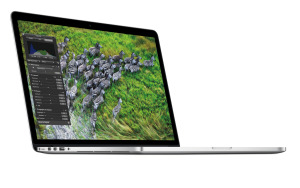 The 11-inch Air has a claimed battery life of up to 5 hours, with the 13-inch Air boasting up to 7 hours. Apple’s battery estimates are based on “wirelessly browsing 25 popular websites with display brightness set to 50 percent.” We test using tasks designed to drain the battery more quickly, but our results show roughly four hours of battery life for the 11-inch Air (slightly better than the 2011 model’s battery life), and around five hours of use for the 13-inch Air (about the same as its predecessor). There is one change to the Air’s enclosure, though: The built-in camera is now, in Apple’s parlance, a 720p FaceTime HD camera. In other words, the camera can record video at 1280 by 720 resolution. In my testing, the new camera still produces grainy images and video with less-than-optimal color accuracy, but it’s noticeably better than the camera on my 2010 MacBook Air. 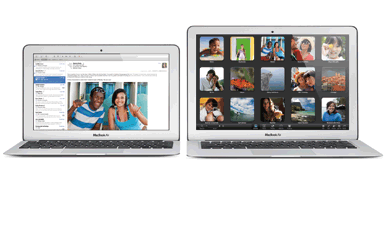 The 2012 Air ships with OS X 10.7 (Lion)—including Lion Recovery—and iLife (iPhoto, iMovie, and GarageBand). Anyone who buys a 2012 Air is eligible for a free upgrade to OS X 10.8 (Mountain Lion). The big changes this year are on the sides and the inside. Like the 2011 Air, the new model sports a Thunderbolt port for both high-speed peripherals and connecting external displays. (Fans of FireWire, take note: Apple has also announced a Thunderbolt to FireWire 800 adapter, although we’re still awaiting its debut.) But the Air’s two USB ports, one on each side, are now USB 3 versions, making the Air line the first—along with the Retina MacBook Pro—to support the new USB standard. Each USB 3 port gets its own bus, is capable of up to 5 Gbps of throughput, and is backward-compatible with USB 2.0 peripherals. We’re currently testing USB 3 performance and hope to have benchmark results soon, but USB 3 opens up the Air to a big market of inexpensive, decent-performance storage devices. SD Card Reader: The right side of the 13-inch MacBook Air (left) has a SD Card slot, which is not found on the 11-inch model. You’ll also find, on the left-hand edge, Apple’s MagSafe 2 power connector. The new connector is apparently electrically identical to the original MagSafe, but flatter and wider. This means the new Airs, along with the Retina MacBook Pro, ship with a new MagSafe 2 AC-power adapter. Apple sells the $10 MagSafe to MagSafe 2 Converter, a tiny adapter that lets you use older MagSafe power bricks with the new Airs and Retina MacBook Pro, but you can’t use the new MagSafe 2 power bricks with your older MagSafe-equipped laptops. Oddly, the design of the new MagSafe 2 plug forces the cable to protrude directly out—at a 90-degree angle—from the plug. The original MagSafe plug had a similar design, but after many people had problems with the cable fraying where it entered the plug, in 2010 Apple switched to a lower-profile, L-shaped plug that didn’t fray as easily and was more difficult to accidentally knock loose. We’ll see how this new (old) design holds up over time. The right side of the 13-inch Air continues to host an SD card reader. On both sizes, the left side sports a tiny microphone along with a 1/8-inch (3.5mm) headphone jack that also supports headphones with an Apple-style inline remote/microphone module. The Air continues to support 802.11a/b/g/n wireless networking and Bluetooth 4.0. Some of the new Air models’ biggest changes are found on the inside. For starters, the 2012 Airs use Intel’s third-generation Core processors (also known as Ivy Bridge) for better performance, making Apple one of the first vendors to adopt these chips in their non-workhorse lines. Specifically, the 11-inch Air uses a 1.7GHz dual-core Core i5 processor with 3MB of shared level–3 cache, while the 13-inch Air uses a 1.8GHz version; a 2.0GHz i7 processor with 4MB level–3 cache is available as a built-to-order option. Like the previous Core i5 and i7 processors (known as Sandy Bridge), Ivy Bridge CPUs include hyper-threading and Turbo Boost. Hyper-threading lets the CPU’s two cores be utilized by the OS as four. When only one core is needed for a task, Turbo Boost lets the chip shut down one of the two cores and bump up the clock speed of the other. Turbo Boost can reach 2.6GHz on the 1.7GHz i5 and 2.8GHz on the 1.8GHz i5. Turbo Boost on the 2.0GHz i7 CPU can reach 3.2GHz. How We Tested: In Handbrake 0.9.5, we encoded a single chapter (to H.264 using the application's Normal settings) from a DVD that was previously ripped to the hard drive. 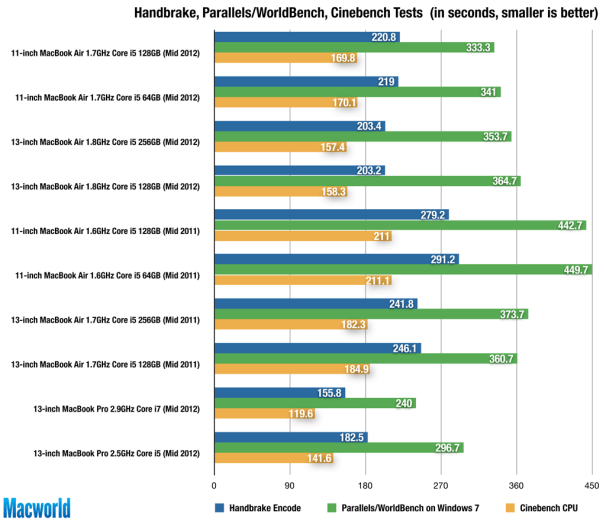 We installed Parallels 6 and ran WorldBench 6’s Multitask test. In Cinebench, we recorded how long it took to render a scene with multiprocessors. 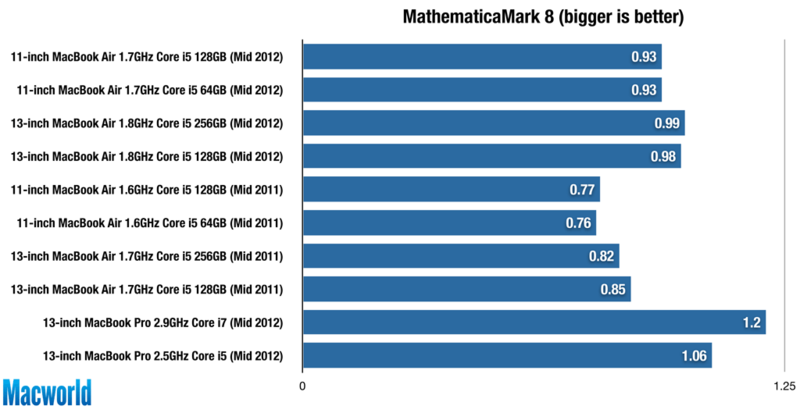 How We Tested: We ran Mathematica 8’s Evaluate Notebook Test. Last year’s Airs offered big performance gains over their predecessors thanks to the switch from Core 2 Duo to Core i5 processors. While this year’s Airs don’t offer as big of a jump, our benchmarks show that the new Airs are roughly 15 to 21 percent faster in processor-intensive tasks (namely, our Cinebench CPU and MathematicaMark8 tests) than their immediate predecessors, and that’s the case for both the 13-inch and 11-inch models. When it came to graphics performance, the 2011 Air was in some ways a step back compared to the 2010 model. Though both versions used an integrated graphics processor (GPU), the 2010 model’s Nvidia GeForce 320M performed significantly better than the 2011 Air’s Intel HD Graphics 3000 in our traditional benchmark tests, such as Cinebench’s OpenGL test and a Call of Duty demo. However, when we used apps that had been specifically optimized for Intel graphics, such as Valve’s Portal 2, the 2011 Air’s GPU slightly bested its predecessor’s. For 2012, the Air line has been upgraded to an Intel HD Graphics 4000 GPU. While still an integrated GPU, Apple claims the 4000 is up to 60 percent faster on graphics-intensive tasks than last year’s 3000. 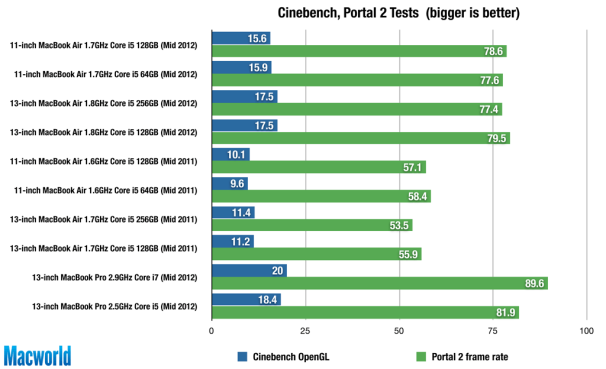 In our testing the 2012 Airs were indeed around 60 percent faster in our Cinebench OpenGL test, though only 20 to 25 percent faster in our Portal test. So while Apple’s claims may not hold up across the board, it’s clear that the 2012 Airs gain significant graphics improvements and comfortably best all previous generations in this area. 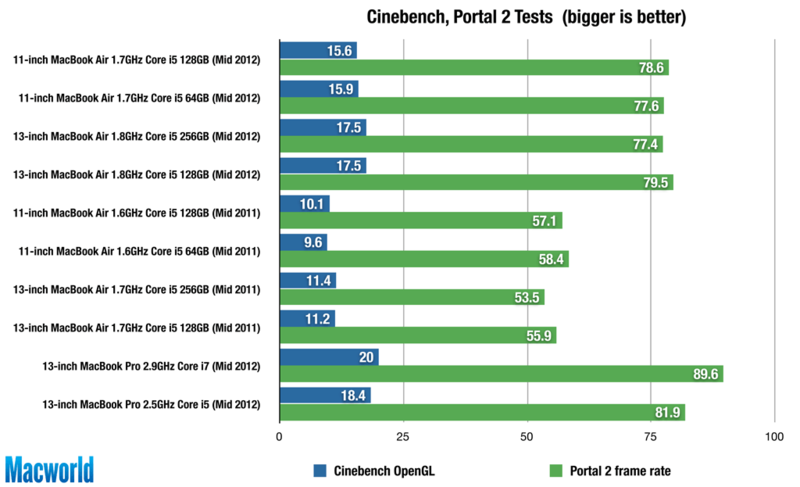 How We Tested: In Cinebench, we ran that application’s OpenGL frames-per-second test. Using Steam and Steam for Mac, we created a self-running demo for Portal and recorded the frames-per-second rating. There’s one additional graphics-related feature that Apple isn’t advertising: Once you update your 2012 MacBook Air with the MacBook Air (Mid 2012) Software Update 1.0, you can connect two external Thunderbolt displays for a total (including the built-in display) of three displays. This is similar to the four-display capability of the Retina MacBook Pro. When it comes to RAM, all four MacBook Airs, including the $999 entry-level model, now ship with a minimum of 4GB, and you can upgrade any 2012 Air, at the time of purchase, to a whopping-for-an-Air 8GB. These days, 2GB just isn’t enough for anything but the most-basic usage, and since you can’t upgrade the Air’s RAM later, you’re stuck with what you initially buy. As someone who’s been using a 2010 MacBook Air with 2GB of RAM for a year and a half, I can tell you from personal experience: This is a welcome change. Memory is also a bit faster this year, jumping from 1333MHz to 1600MHz.